Tourist Jacqueline Rodriguez, who snapped the photograph above, was one of many who were privvy to a sight that the Egyptian Museum in Cairo has just confirmed. 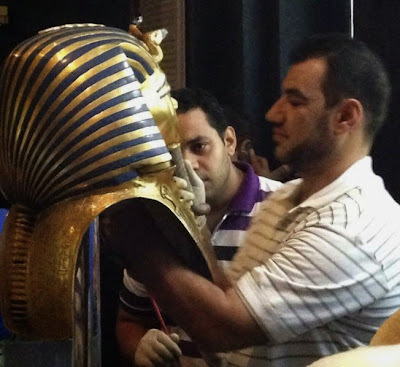 In August of last year, the blue and gold beard on the mask of King Tutankhamun broke off during the cleaning of its display case. Rather then removing the precious artifact to the conservation lab, staff – on orders from above – simply glued it back on with epoxy. What has been done cannot be undone, so the mask now exhibits a yellow layer at the site of the break and scratches where misplaced epoxy was scraped away with a spatula. "The mask should have been taken to the conservation lab but they were in a rush to get it displayed quickly again and used this quick drying, irreversible material," said a museum conservator who was not consulted prior to the botched repair.